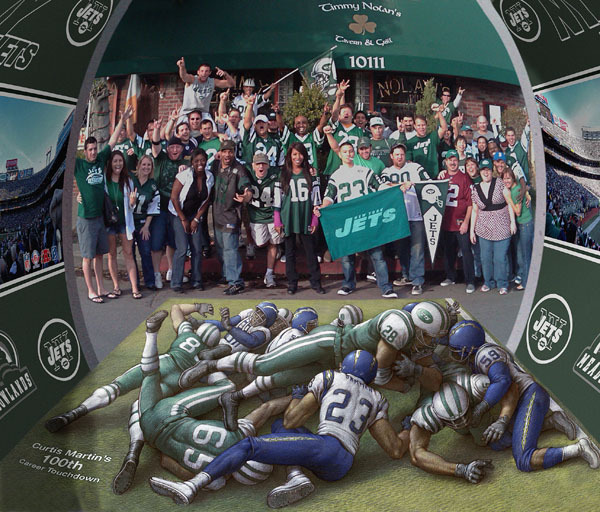 I did this work for the New York Jets a couple of years back. I am not a sports fan, but I did watch a whole game and found it more enjoyable than I had imagined. Part of doing the 3D pavement art is having new experiences and learning about new things. I was surprised at the sheer amount of information and statistics that is thrown at the audience during a single game. I can guarantee that it is easier to learn about art history or Italian opera. In his first seven seasons with the Jets, Martin missed only one game and was selected to the Pro Bowl three times. In 1998, Martin gained 182 yards from scrimmage and scored two touchdowns against the Jacksonville Jaguars in a Jets playoff win. In 2004, Martin rushed for a season-high 196 yards against the Cincinnati Bengals in the team’s home opener and would do so eight more times that season, finishing with 1,697 yards. Martin won the NFL rushing title by one more yard than runner-up Shaun Alexander and became the oldest player, at age 31, in league history to win the rushing title. Martin was named the FedEx Ground Player of the Year and named an All-Pro and elected to his fifth and final Pro Bowl. He was selected for induction to the Pro Football Hall of Fame on February 4, 2012 and formally inducted on August 4, 2012. Martin’s speech, which he conducted without notes, was widely praised by critics for its sincerity. 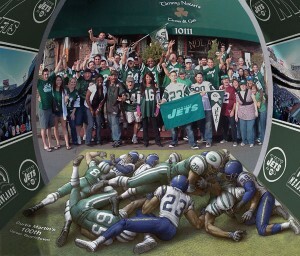 Thanks to Frankie Gabagool, Timmy Nolan’s Tavern and the Los Angeles Jets Fans for the group photo.